A new facebook worm malware application 'makemelaughnow' is out in the wild. It escapes FB sandbox mechanisms and activates BEFORE displaying the credentials form - only by visiting application home page you send messages to your friends and update your status. 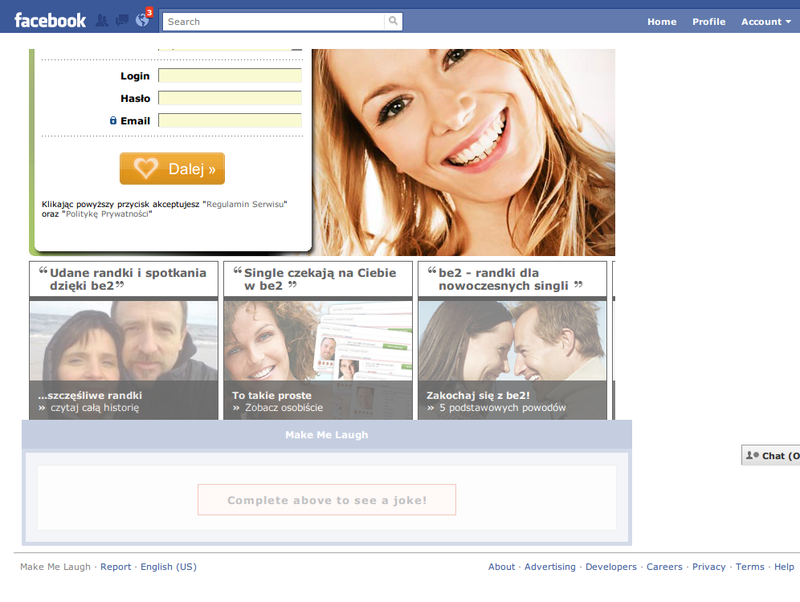 As the news on niebezpiecznik.pl say, it uses Facebook mobile site (touch.facebook.com) to propagate. I did a quick analysis - Let's take a look on what's exactly going on in the app code. 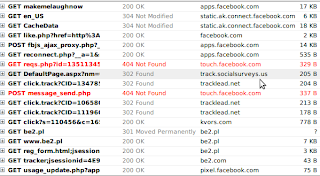 to /etc/hosts (that redirects all requests to touch.facebook.com to my computer), but please be more careful. You've been warned. The app, even before requesting any permissions from you, sends requests to touch.facebook.com possibly sending messages and performing other actions on your behalf. These are marked red in the screenshot (I block touch site). After that the ads from be2.pl are downloaded. So the app is clearly some sort of malware. After downloading the JSON file locally and extracting it (I used PHP & Spidermonkey for extraction and Eclipse for formatting) we get the final app code (see step2_2.js ). For convenience, I replaced the BIGNUMBER with 'x' character. All the code used in this post is hosted on github.com - take a look, it's really interesting. It looks as if the title is some sort of a key that could be used to decrypt the hidden application variables. And we're right. In fact, choy:ketmdslqxb.ujpzgvnra/fiw_?= is a dictionary - ax_create.help() function picks characters from this dictionary to form URLs, field names etc. The character offsets are defined in, slightly obfuscated ax_meth variable. Ok, so the app is obfuscated and uses DOM object to decrypt its variables. But what does it do? // value = type="hidden" id="fb_dtsg" name="fb_dtsg"
This variable contains some interesting regular expressions - these are used to extract all your friend IDs, your own ID and a few unique credentials from HTML code embedded by Facebook with the application. But the app could do nothing with this data, as we're protected by sandboxing, right? Well, not really. What we can see here, is that an app is probably using a vulnerability in Facebook where mobile site is using the same credentials as normal site, but is not protected by sandbox mechanism. So the app, instead of asking for permissions to e.g. update your status, silently gets the session data from DOM and sends the requests through touch.facebook.com, avoiding sandbox protection and spreading quickly - so it's similar to CSRF / session hijacking vulnerability. It's clearly an error on Facebook site that's being exploited. Lesson to be learned - don't forget about your mobile sites. Thanks Krzysztof, this is helpful! Thanks for the nice analysis and the time spent! 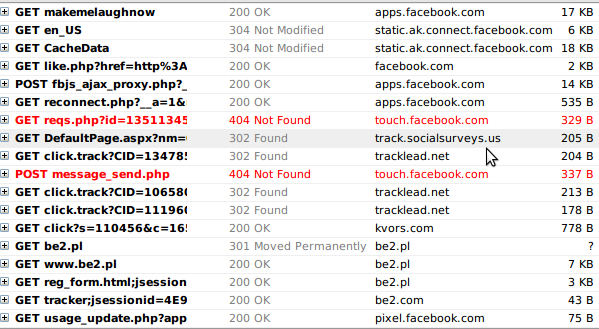 Maybe we can learn a lesson by not repeating the same error Facebook fallen in cross-site session granting.